Wavy and curly hair can easily lose its definition, Curl Defining Cream brings it back. Advanced heat-activated technology provides intense conditioning and activates a curl memory factor to keep hair bouncy and control frizz for hours. Argan oil and protein condition, detangle and tame curls, so hair remains smooth and frizz-free with great movement. Apply a generous amount to clean, towel-dried hair. To activate and enhance curls, diffuse hair. For a more relaxed curl, let hair dry naturally. 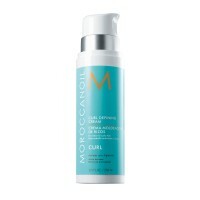 Curl Defining Cream can also be used to refresh curls and reduce frizz throughout the day. Apply 1 pump from mid-length to ends and reapply as needed. Additional heat from a diffuser can be used to reactivate the curl memory. Heat-styling tools may also be used to define and style curls.